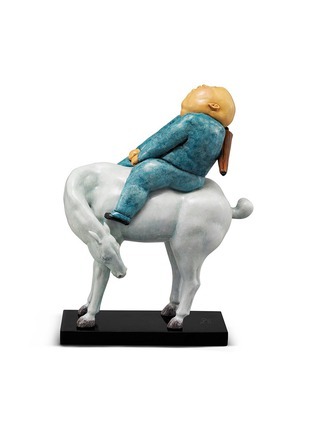 Inspired by Italian sculptor, Marino Marini's famous piece 'Horse and Rider', this statue by Qu Guangci of renowned Chinese artist duo X+Q is a whimsical statement for the contemporary living space. 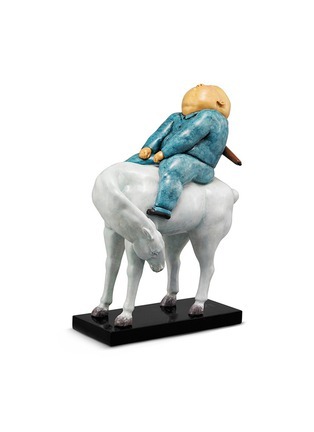 Transforming Marini's despairing art into a wistful pursuit towards a dream, this work depicts a portly man searching the skies while riding a traditional Chinese stallion. Fantastical and brimming with hope, this specimen will stir up deep empathy from the viewer.